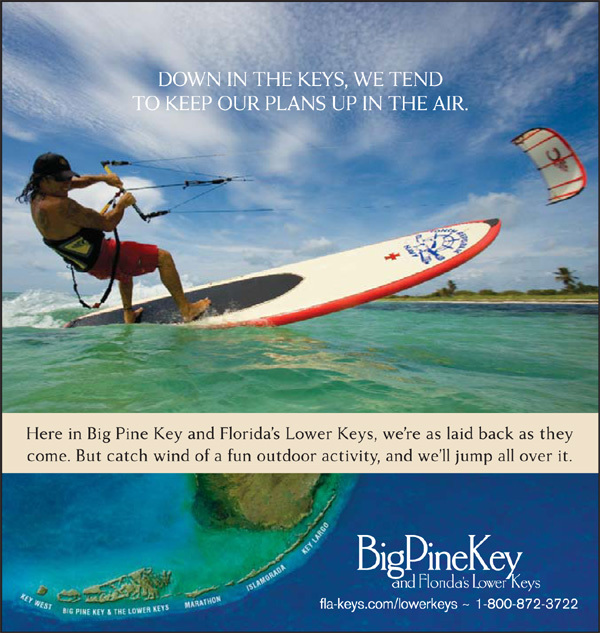 There's a whole world out there for riding... A great kiteboarding destination has just become even better... Key West. THE KITEHOUSE has introduced an exciting new concept to kiteboarding... Riding the Island Flats. WARM, knee deep water for launching and riding, deeper channels for popping jumps, RIDEABLE wind from all directions and no beaches to run into. And, then there is the WIND… Average and peak winds going way back for Sand Key that reflect conditions miles offshore and in the Flats, looking good! Remember winds are generally better offshore, away from land where winds are often lighter. Paul Menta tells me that there are thermal winds at times in the Flats that are absent closer to the Keys. The trip over the Overseas Highway and Seven Mile Bridge is a unique experience. Heading down the Overseas Highway Or you could just fly in... Today there is a great shoreside airport for turbo props and some jets. The flats present an excellent learning environment for new riders. Steady winds, shallow water, no waves to slow progress, no beach to run into and instructors to follow along by boat or kayak as you learn this great sport. Without waves and beaches to avoid, learning progress can be phenomenally fast. Experienced riders will eat up all those butter conditions and throw down tricks out the wazoo as they rip through the flats. There are even some wave spots not too far away ... shhhh. Downwinders, we're talking about some EPIC downwinders among the mangrove cays of the Flats. Top off a singular sesh with some free diving for lobster and fish for dinner. Is your wife, husband, kids, boyfriend, or girlfriend tired of being left behind on the beach? No problem, bring 'em along to hang out on the water on the houseboat to enjoy the Flats and sun and watch you go off in all the great riding conditions. You can just feel it's going to be a great day! Get in touch with THE KITEHOUSE to learn more about Key West and to book accommodations and kiting trips at this outstanding destination. It offers more than just wind, as if that isn't enough, but also a vacation for the friends or family. That's Key West. When it's good, it's GREAT! Paul Menta, founder of Kite Surf the Earth which evolved into the Kitehouse, is a championship-level wake boarder and competitive kitesurfer. He has been involved with water sports since the age of 6 when his father put him on a set of water-skis. He progressed from water-skiing to wakeboarding in his teens and found the sport would not only allow him to compete on a professional level, but also allowed him to earn a living doing what he loves. From wakeboarding, kitesurfing was the next obvious step. Now listed as a Master instructor for PASA, Paul trains the world’s instructors as well as students with techniques that he has developed and perfected after teaching 1000+ students. Along with appearances on video and in print, Paul regularly writes for several sports magazines and has published numerous manuals on all aspects of kitesurfing. He was also the event director for the Velocity Games extreme sports competition and many other events around the world . Going on now to put together the first ever Kiteboarding University that is national recognized. Paul worked 13+ years as an executive chef, with experience in France, Italy, Spain and South America. His exotic travels have allowed him to broaden his understanding of culture and humanity. He’s seen many parts of the world and knows where the good kite surfing spots are located. Paul can give you the local's view of the area as opposed to the tourist view. This makes him an excellent guide to ask him questions about kite surfing sites or to book your own personal kite surfing package around the world. Paul is fluent in Spanish. While Paul operated the Kite Surf the Earth training schools in 1999, he began to notice how his guests didn’t want to go back to their hotels after a day of kitesurfing. They wanted to spend the night hanging out with Paul and the other trainers in the “kitehouse” where the equipment was stored and where Paul and the trainers bunked. Guests were happy to sleep on the floor or pullout couches to have the chance to live like pros, share a beer and hear their stories. Return guests would call ahead and request to stay in the kitehouse instead of a hotel. It was apparent to Paul that his guests wanted more than a vacation, they wanted the whole experience. The Kitehouse was born. The Kite House can be anywhere and has an open door policy, mostly as a hand-out as people now stay at guest houses and hotels. The Kitehouse is a place where the instructors go to get trained and the pros go to practice new moves before the big competitions. The pro cache also makes it a cool playground for average (or above average) Joes to get away from everyday existence. Each Kitehouse is designed to immerse guests into the kitesurfer’s lifestyle, giving them face time with Paul and the pros, while providing comfortable and unique accommodations. Guests have more activities and more options. Ultimately, it’s pure escape. Stepping outside of your normal routine allows you to develop a new frame of mind. The Kitehouse is the perfect environment for testing new equipment, learning new moves, training, and thinking of new ideas. Why is the Kitehouse’s logo a tribal symbol? Visiting the Kitehouse changes you. You’re a little tougher, a little more fearless. A little more free. Once you’ve been a part of the kitesurfing lifestyle, rode with the pros, made fast friends, traded stories with Paul and the gang, you become a part of a tribe. No matter where you are, no matter where you go, you’re on the inside of the sport. The tribal symbol is a tattoo, a mark of honor and bravery that brands our guests as mavericks. In the world of kitesurfing, you’re not a groupie. You’re one of the tribe. WHY WOULD YOU EVEN ASK THAT. There are as many women riders today as male. We have female instructors as well as male. If you have any special preferences, just let us know when you book or before you get here. What is the Kitehouse's training philosophy? Safety first is our policy. We do everything we can to make sure you’re safe and well-educated before you go out. We will first teach you how to kite with your brain and be prepared for any situation, so that you can take care of yourself on the water. How is the Kitehouse different from other kitesurfing training vacations? We go beyond the day, and live the night. Tribes band together. Other schools, or clubs don’t do this. It’s a job, for us a way to enjoy LIFE. Kitesurfers are a different breed. They’re afraid of less, they have fewer material needs, and they know how to live in the moment. We’ve captured the essence of the lifestyle and have created a sanctum where guests can feel what it’s like to be free and alive. Your experience is a two-way interaction. We don’t drop you off at the end of the lesson to fend for yourself. We invite you taste our elusive and exciting culture. We know that a vacation should be an escape and a renewal. The Kitehouse is designed to leave you with inner peace, renewed confidence and ultimately, a sense of belonging. And since the real pros and instructors train and vacation with us, the Kitehouse delivers an authentic experience. And it doesn’t hurt our credibility that we were voted “Top Kite Vacation” by Outside Magazine. What do I need to know about equipment? Everyone has their own personal preference when it comes to kites and boards. We are very particular about what equipment we use, which is one of the reasons the Kitehouse is so popular. We test equipment regularly so we have a first hand knowledge of what’s available on the market. Don’t be surprised to see the owner or developer of an equipment company testing prototypes at the Kitehouse. Ultimately, we’ll handle all your equipment needs. All we need to know is your weight range so we can select the best kite for you. Advanced and pro-level riders may want to bring their own equipment and that’s fine with us. Either way. What’s the best way to transport my equipment to the Kitehouse? WHY BRING IT WE GOT IT! What’s the best way to know if I’m getting professional-level kitesurfing lessons? Everyone is offering lessons these days, so your first concern is to make sure you’re getting your education from the cream of the crop. The Kitehouse instructors are selected by Paul Menta, who is recognized as one of the sport’s first early adopters and writes training manuals for water, snow and land. Not only is Paul an instructor with years of experience teaching pros and amateurs alike, but he’s hand chosen each Kitehouse instructor, all of which are certified (We teach instructor certification). Paul and his instructors kite daily. Is there anything I need to know about taking kitesurfing lessons at the Kitehouse? We’re fully insured and provide one-on-one lessons. We also have a huge inventory of kites, boards and equipment so we can get you the best kite for your weight and the conditions. What do I need to bring to the Kitehouse? Sunscreen, hat, sunglasses, board shorts, rash guard or other long-sleeve shirt to keep the sun off, and a positive attitude!! What if I don’t need training and I just want to ride and relax? No worries, we take care of all your needs so you can do the important stuff with your time... RIDE! We pump up your kites, help set your lines, have drinks ready when you need it, lunch, take video, pictures, and have that chair or hammock ready when you want to chill before your next session. Also, we map out rides for you, and take you on excursions to other cool ride spots, want to do something special...let us know, we will set it up, it's your vacation.